Charley has always been a good eater. She will pretty much eat anything you put in front of her. The slight problem is she enjoys eating with her hands. We have tried several different types of cutlery designed for little hands, all have been tossed aside in favour of the cave women method. While reading one of my favourite blogs The Frenchie Mummy I saw a review of Benjamins Children’s Cutlery Set and loved the idea behind the set. 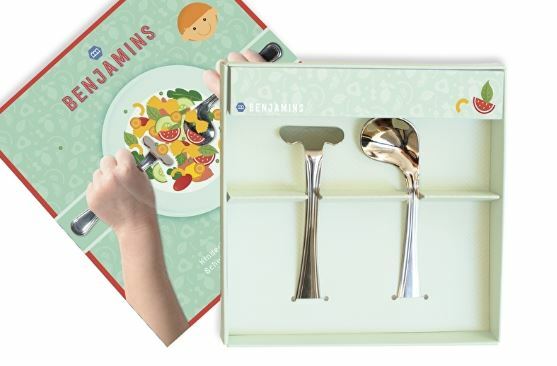 Benjamins Children’s Cutlery Set is shaped rather differently from other children’s cutlery: it is fully adapted to kids movements. The set consists of a curved little spoon and a pusher. Perfect for little hands, they use the pusher to move their food across to the plate and can then easily bring the curved spoon to their mouths. Nominated for the baby innovation awards 2017, Benjamins Children’s Cutlery Set was founded by Bernadette: mother of two rather stubborn kids, who enjoyed decorating the ceiling instead of eating food. If she could design something to help tame her little monsters I thought I would try it with my little cavewomen. 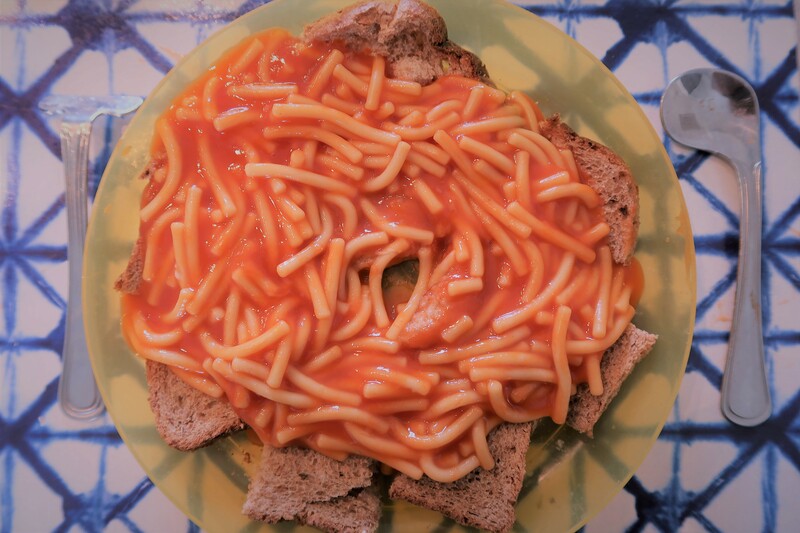 Spaghetti on toast is one of Charley’s favourite lunchtime meals and also one she has no qualms about sticking her hands into. By the end of each meal, the kitchen worktop and bar stools are normally covered in tomato sauce & stringy spaghetti pieces. If I could convince her to use the spoon & pusher for this then all other meals would be a breeze. I set her lunch up on the counter as usual and placed the new cutlery set next to the plate. There was a slight Mexican standoff moment where I could see Charley’s rebellious streak wanting to take over but with a little bit of encouragement, she picked both the spoon and the pusher and set to demolishing her spaghetti. The set is a lot more lightweight than traditional kids cutlery and the ergonomic design means your kids don’t need to twist their hands to get the spoon up to their mouths. 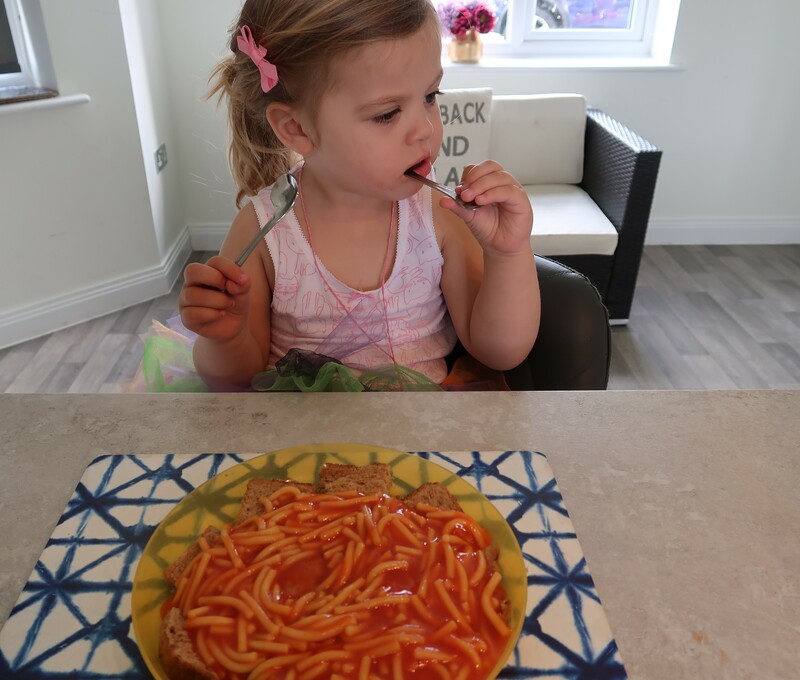 It took a couple of seconds for her to realise what the pusher was as it doesn’t look like anything I would normally put down next to her lunch but once I showed her what to do with it she was soon piling her spoon high with toast & spaghetti. The real test was that 90% of the food went into her mouth and not all over her and the kitchen. This is going to stop hours of trying to get stains out of her tops and save the 1/2 hour clean up routine I have to do after each meal. Charley is now a total convert to using cutlery instead of her hands. She has even started eating her favourite handheld snack of peas with the spoon & pusher combination. The set is recommended for weaning children 12 months + and having spent a fortune on character themed rubbish to charm Charley into not eating with her hands i wish I had purchased the Benjamins Children’s Cutlery Set first. I was sent the Benjamins Children’s Cutlery Set for the purpose of review but all my thoughts & opinions are my own. "Choosing The Right Childcare with Childcare.co.uk"
"The Escape ( To Reality )"